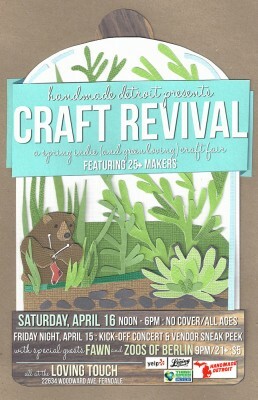 Handmade Detroit | Craft Revival and Green Week Start Saturday! Craft Revival and Green Week Start Saturday! Can you believe it?! With gorgeous weather and sunnier days, I’m feeling pretty confident that spring is here. I’m usually even more confident spring is here when it’s time to open the doors at The Loving Touch for Craft Revival and get Ferndale’s Green Week underway! Here’s what to expect at the fair and next week during Green Week. Join Fawn and Zoos and Berlin for a vendor sneak peek inside The Loving Touch Friday night. Doors open at 9 p.m. and cover is just $5. With more than 25 crafters and makers, now is a good time to get a jump on gifts for Mother’s Day, graduations, baby and wedding showers, etc. The Loving Touch will be a one-stop destination for all things creative this Saturday. For our younger crafters, we’ll have a special crafting surprise for you to create at the fair or take home for later inspiration. And for our grown-up crafters, we’ll be offering a station to make wine cork-stamped holiday cards with a modern flair. What better way to recycle your wine corks?! Check back here this week for a sneak peek of the cards. For all our quilters out there, you can donate 2-inch strips or finished blocks for a donation package we’ll be sending over to the Quilts for Quake Survivors initiative in Portland, headed up quilting queen Susan Beal. If you have any questions, leave a comment below. Don’t listen to Kermit the Frog – it IS easy being green! Each day of Green Week focuses on a different theme. Craft Revival is Craft Day, of course!, with the following themes for the rest of the week: bicycle, movie, water, garden, youth, local and Earth Day itself. Learn more about the fair, and each day’s activities over on Ferndale’s own web site. 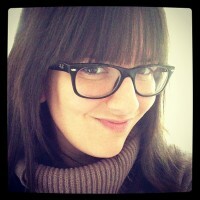 Pingback: Perfect Laughter » Spring Shows!